That’s why, when I was asked to make stuff for this weekend’s baby shower, I quickly offered to make these limey summer treats. The time is way overdue. I’ve been craving them, but needed an excuse to make a big batch. Celebrating the arrival of Baby Boy L is an excellent reason to make these festive treats! Just FYI, the Cooks Illustrated magazine I originally made these out of says that bottled lime juice is inferior, so use fresh lime juice if you can. They also said that the variety of lime you use shouldn’t affect the final outcome much, although apparently Persian Limes yield a lot more juice than Key Limes. I’m not sure what kind of limes I picked up– I just got the ones that were selling nine for $2.49 at Trader Joe’s. Whether it’s for a baby shower, July 4 festivities, a summer picnic, or vegging in front of the TV, I highly recommend you give these tangy lime bars a go! They look pretty, and more importantly, taste really good! Line an 8-inch square baking pan with foil and spray with non-stick cooking spray. Make the crust: using a food processor, pulse animal crackers until fine. You should have about 1 1/4 cup crumbs. Add brown sugar and salt, process to combine. Drizzle butter over crumbs and pulse until crumbs are evenly moistened with butter. Press crumbs evenly and firmly into bottom of prepared pan. Bake until deep golden brown, 18-20 minutes. Cool on wire rack while making filling. Do not turn off oven. Make the filling: While crust cools, in medium bowl, stir cream cheese, zest, and salt with rubber spatula until softened,creamy, and thoroughly combined. Add condensed milk and whisk vigorously until incorporated and no lumps of cream cheese remain. Whisk in egg yolk. Add lime juice and whisk gently until incorporated. Mixture should thicken slightly. Pour filling into crust, spreading to corners. Smooth surface with rubber spatula. Bake until set and edges begin to pull away slightly from sides, 15-20 minutes. Cool on wire rack to room temperature, 60-90 minutes. Cover with foil and refrigerate until thoroughly chilled, at least 2 hours. Loosing edges with paring knife and lift bars from baking pan. Cut bars into 16 squares. Sprinkle with toasted coconut, if using, and serve. Leftovers can be refrigerated up to 2 days; crust will soften slightly. Let bars stand at room temperature about 15 minutes before serving. Made this with Judy (Wendy’s sister) the other day for a baby shower. We used graham crackers for the crust, and nothing on the top. It was DELICIOUS! Thanks for the recipe, Jo! Was Delicious! I tried it with animal crackers and I think it tastes about the same as graham crackers. But it was cheaper! I made these yesterday evening and cooled them overnight. They don’t look exactly like yours. They are more flat, I think that’s because I might have miscalculated inches to centimeters (I always have troubles doing that). And I used digestive biscuits for the crust (no graham or animal crackers in The Netherlands). Oh and lemon juice in stead of lime. So in the end a complete different recipe. But they taste great! Woohoo! I’m glad it worked out for you! 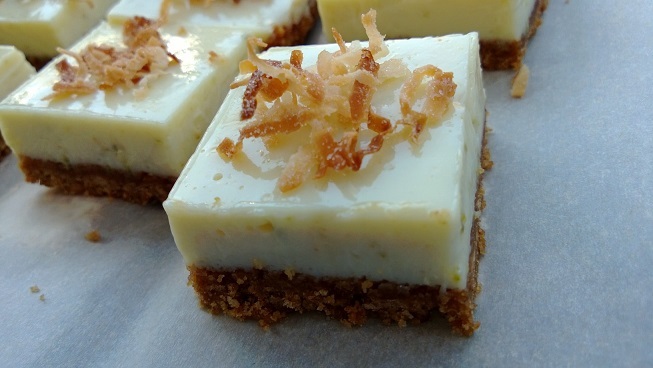 Cooks’ Illustrated actually also has a variation on the Key Lime Bars which is their Triple Citrus Bars– essentially the same thing but with lemon, lime, and orange juice. I imagine that to be mighty delicious, so I bet your lemon bars were great! As for the flatness, I actually almost always double my recipes and bake it in a 9″ x 13″ rectangular baking pan. This makes for thicker bars, since two 8″ by 8″ batches would be 128 square inches (instead of the 117 square inches of a 9″ x 13″ baking pan). Also, I am tickled to be communicating with someone from The Netherlands! THE INTERNET IS SO COOL!